SGT's David and Tricia Aponte. Myself, CW4 Dave Bassili. "Been in 22 years and still going strong. 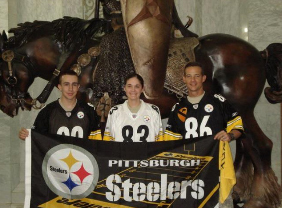 Just tell Ben and the boys win or lose, I still bleed black and gold! And why did it take so long to start going to Heath more than for just an outlet…just kidding! Just win, that's it! Go Steelers!!"